The Student Assignment Competition is open to all students studying at land-based colleges in the region and is designed to encourage individual research, to improve knowledge and develop study skills. The closing date is 1st July 2018. An independent judge is appointed and prizes of £150, £75 and £50 will be awarded to the top three entries in each category at a presentation ceremony to be held at the Autumn Show and Game Fair on 7th October 2018. 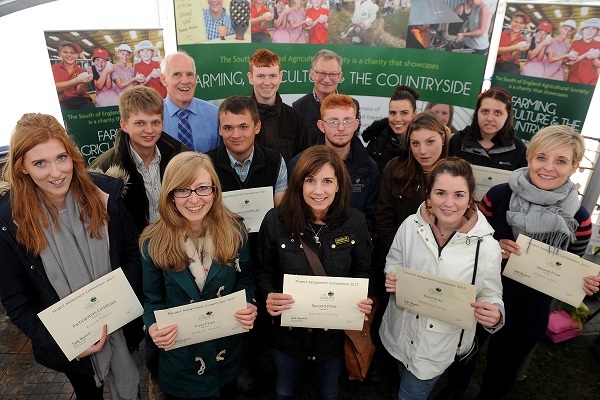 South of England Agricultural Society’s Student Assignment Awards were presented at the Autumn Show and Game Fair [October 1] by Society Deputy President, Michael Lambert LVO and agricultural education expert and judge of the competition, Geoff Gregory. Jordon Holdway from Sparsholt College in Hampshire won first prize in the Level 1 category for a study in the principles of maintaining the health of extensive crops. Agricultural expert Geoff Gregory judged the competition and described Jordan’s study as having clear evidence of the learning journey for someone at the beginning of his career in agriculture, which included the safe operation of machinery and the production of a visual aid for disease recognition. Jordon, who graduated from Sparsholt in 2016 is now well established as an apprentice on a local farm. Rebecca Hersey won first prize for her Level 2 Assignment with an excellent presentation in the many aspects of a career in floristry. After successfully graduating from Plumpton College last year, Rebecca is now working at two florist shops in Sussex. Countryside Management student, George King’s winning entry for Level 3 category on Hedgehogs was a crowd pleaser, with judges describing his study as a very impressive document enabling householders to understand what hedgehogs need and how to encourage more of them into gardens. Viticulture student, Huw Sinclair Smith impressed the judges with his entry in the Level 4 category which looked at the effect of blue and red light emitting diodes on grapevine morphology. Huw was unable to attend the presentations, but judges described his project as an excellent investigation that would future benefit the UK wine industry, providing new knowledge and superbly documented to facilitate further work into this important technology.